Britain’s two previous attempts to join the European Community – in 1963 and 1967 – had been humiliatingly rejected by the French. Two British prime ministers – Harold Macmillan and Harold Wilson – had both failed. Brought to power in the 1970 elections a new leader, Ted Heath, was determined to have a third try. But Heath faced two massive challenges: negotiating a place for Britain in Europe, and bringing the British public with him. Like so much related to the history of Britain’s relationship with Europe, the story of Britain’s three attempts to join the EC are largely forgotten by the general public. Yet, as well as fundamentally changing the course of British post-war history, they can clearly inform current discussion of Britain’s place in Europe. So, what had changed between 1967 and 1973? First, and perhaps most important, was the fall from power of General de Gaulle. De Gaulle, who had vetoed both British applications, was a victim of the 1968 student protest which forced him from the office he had held for a decade; in his place, the new president Georges Pompidou was considerably more sympathetic. 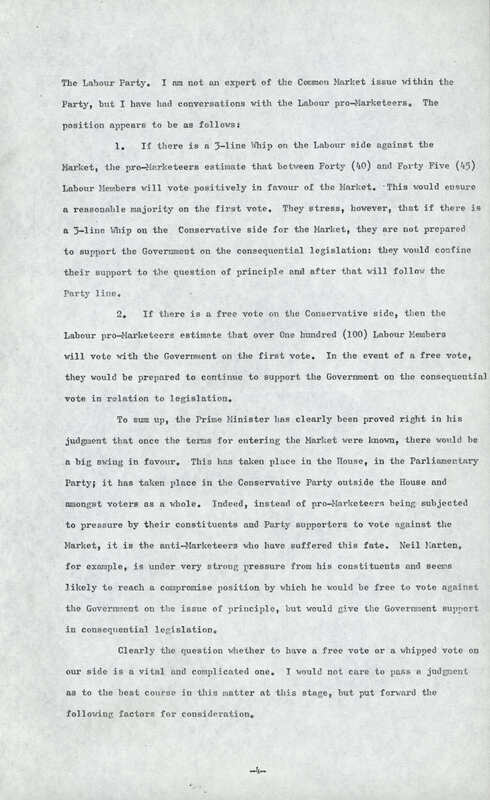 Brought to power in the 1970 general election, the Conservative government of Ted Heath decided that the time was right to revive the application that had been left dormant in 1967 after the veto. For Heath, the domestic pressures for Britain to enter the EC were just as powerful as they had been for Wilson. The lack of export markets for British industry was becoming an ever-greater problem and hastened the decline of British living standards. In 1945, Britons had been 90 percent better off than citizens of ‘the Six’; by 1969, they were six percent poorer. Negotiations opened in June 1970 alongside parallel negotiations with Britain’s traditional allies Ireland and Denmark. In January 1972, Heath finally signed the accession treaty in Brussels. The diplomatic negotiations were just the first obstacle that Heath faced; bringing Britain into Europe would also require the support of his party and the British electorate. This was a challenge that faced the Conservative Whips as they tried to make sure that enough MPs would vote with the government to pass the European Communities Act – the piece of legislation that was finalise the negotiations. It is on this aspect that many of the papers held by the Conservative Party Archives at the Bodleian focus. CCO 20/32/28: ‘Report and Analysis of the State of the Party’ (c. Jan 1971). 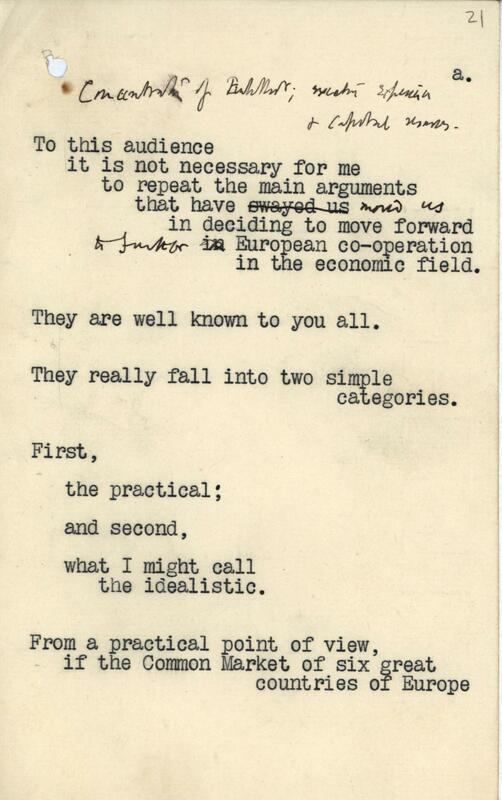 CCO 20/32/28: ‘Third Report and Analysis on the State of the Party on Common Market Issue. August 1, 1971’. Some voters writing into the party expressed their concerns whilst others wrote in support. Ultimately, however, the issue remained unsolved and the public divided. With the Labour Party also ambivalent towards Europe (a radical change of direction), confrontation was inevitable. In 1974, new elections brought Labour back to power with the promise that continued British membership of the EC would be decided by referendum. The result – a surprise 60 percent majority in favour of staying – guaranteed Britain’s role as a major player in European integration for almost half a century. Parliament Week 2016: Britain and Europe: Britain’s second attempt to join the EC, 1966-67. Speaking here at the Labour Party Conference, the Foreign Secretary George Brown was undoubtedly wrong. Britain’s second attempt to join the European Communities (EC) in 1967 would end, ultimately, in the same ignominious failure as its first – shot down by a French veto, wielded by General de Gaulle. However, Brown was certainly right about one important thing: both Britain and Europe were very different in 1967 to how they had been just four years previously. Britain’s three painful attempts to join the European Union’s predecessor are, today, almost totally forgotten by the general public. Yet they can serve an important role in informing current discussions, not least as a reminder of why Britain was so keen to join the union in the first place. Considering the embarrassment of Britain’s failed attempt to enter the European Economic Community in 1963, it is perhaps surprising that the issue returned to public discussion so quickly. Between 1958 and 1963, Harold Macmillan’s Conservative government had attempted to get Britain into the association but had been humiliated, in 1963, when the French president General de Gaulle vetoed British accession outright. In contrast, Britain’s 1967-68 attempt, unflatteringly dubbed ‘the Probe’, under the Labour government of Harold Wilson looks very similar. Yet this is not how it seemed to contemporaries. Britain was a very different place in 1967 to what it had been under Macmillan. For one thing, the attitude of the Labour Party – traditionally the less ‘European’ of the two – had changed profoundly. 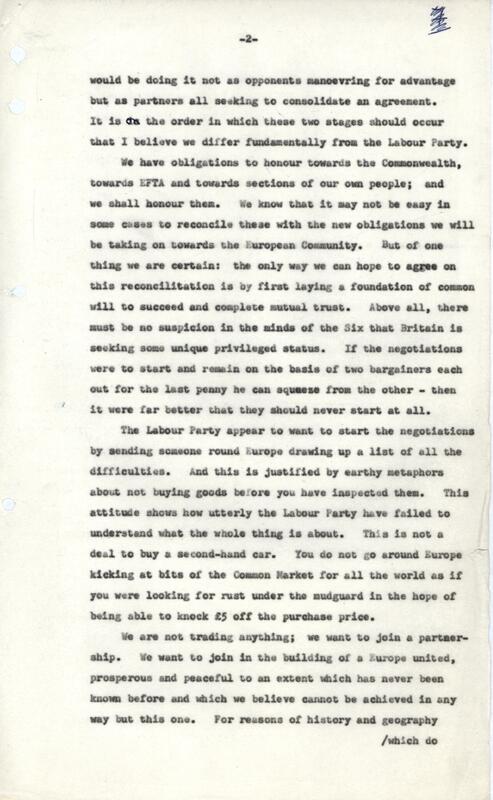 Under Hugh Gaitskell, Labour had vigorously opposed entering the Common Market. In government after 1964, their new leader Harold Wilson led a surprising volte-face. MS.Wilson c.873, iii.3: ‘Problems of Western Foreign Policy’ (undated speech at Wilton Park). Partially, Wilson’s rethinking can be seen as an attempt to outflank his rival – the pro-European, Conservative leader Ted Heath. But it was also a reaction to Britain’s changing circumstances. Importantly, British industry was in ever-faster relative decline. Lack of investment, as well as poor labour relations, led to economic stagnation in contrast to more dynamic continental economies, such as West Germany, which had access to the European market. In 1945, GDP per capita was about 90 percent higher in Britain than in continental Europe; by 1967, the difference was just 6 percent. Soon, Britons would be poorer than Europeans. What really prevented British industry from reaching the ‘white heat’ to which Wilson aspired was a lack of markets. Britain’s own European Free Trade Area (EFTA) could simply never compete with the Common Market set up within the EC. 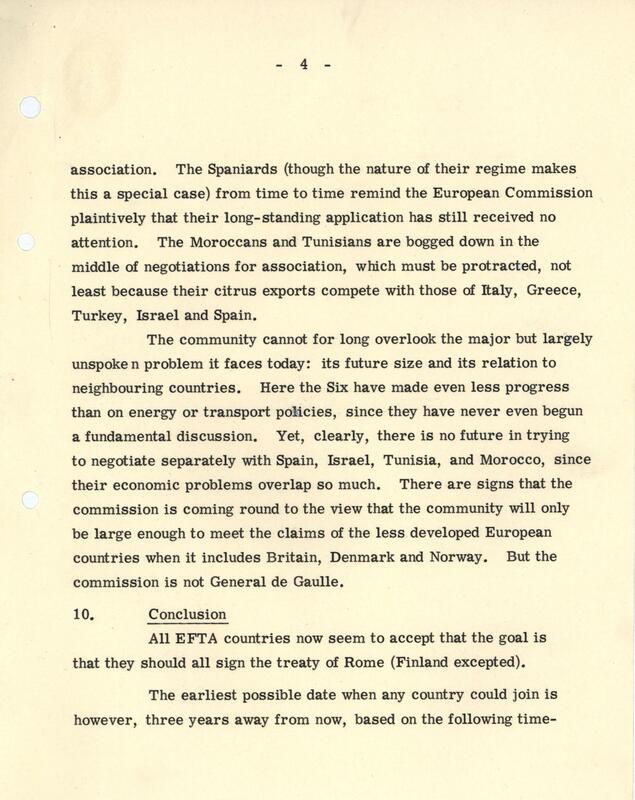 ‘All EFTA countries now seem to accept that the goal is that they should all sign the Treaty of Rome’, noted a Conservative Party report in 1966 (CRD 3/10/2/3). Likewise, the Commonwealth was clearly failing to live up to the expectations of those who hoped that it would one day form a viable trade block of its own. 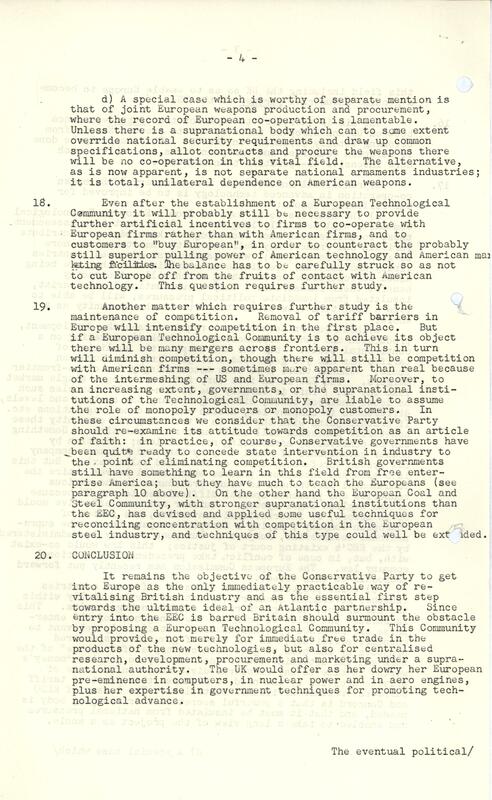 In short, Britain needed Europe or – as a Conservative report concluded – entering Europe was ‘the only immediately practicable way of revitalising British industry’ (CRD 3/10/2/3). CRD 3/10/2/3: ‘EFTA + Appreciation for Association to EEC’ (28 Oct 1966). But if Britain had changed profoundly, so too had Europe. The EC had begun to move in a new direction – one that emphasised the power of national authorities within a ‘Europe des états’ – and this suited the British. Likewise, the new Common Agricultural Policy removed the problem of continuing Britain’s heavy subsidies to farmers which had been a major obstacle in the 1958-63 negotiations. Perversely, much of this change had been brought about by the same man whom the British reviled for his earlier veto. 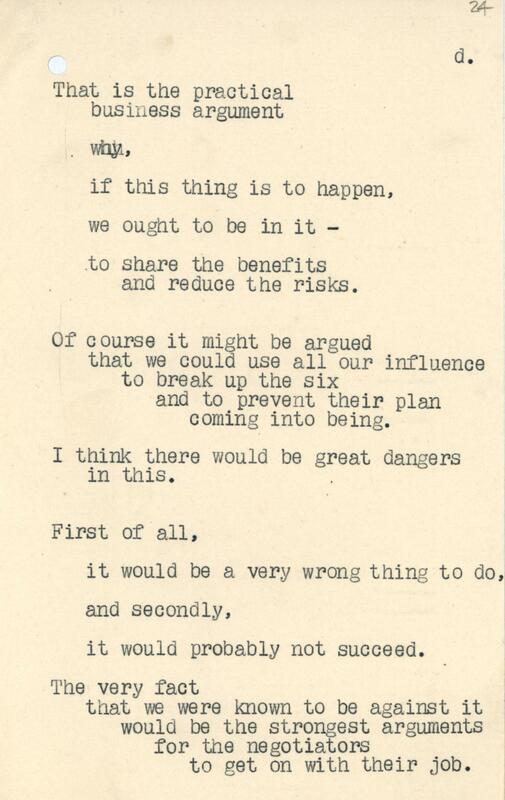 CRD 3/10/2/3: ‘Preliminary Report by the Industrial Sub-Group’ for the Committee on Europe (c. Nov-Dec 1966). CRD 3/10/2/1/1: ‘Brief for Mr Heath for the Television Programme ‘Britain in Search of a Continent’ on 9th June’ (8 Jun 1966). Uncertain of their position – and, especially, the opinion of de Gaulle – Wilson chose to approach the European negotiations cautiously. Stuart Holland, an Oxford academic, was despatched to gauge the French government’s mood through a personal contact, Pierre Joxe. The results appeared encouraging. CRD 3/10/2/1/1: ‘Statement on Britain and Europe’ (27 Mar 1966). Britain officially submitted its application to join the EC in May 1967, joined by its traditional non-EC trading partners: Ireland and Denmark. Everything seemed to be going well. Then, on 27 November 1967, de Gaulle walked into a press-conference and, apparently out of the blue, vetoed British EC membership. It was yet another humiliation. But the mood in Britain had changed in favour of Europe – and, importantly, the British government refused to withdraw its application for membership. Other members of the ‘the Six’ were also becoming increasingly sympathetic to British entry and impatient with de Gaulle’s personal agendas. Negotiations would eventually be re-opened in 1970 and would culminate, in 1973, with Britain finally fulfilling the twenty-year hope of entering the European Communities. Source: Daddow, O. J. (ed.) Harold Wilson and European Integration: Britain’s Second Application to Join the EEC (London, 2016). Speaking at a parliamentary debate in February 1963 shortly after Charles de Gaulle’s veto of British membership of the European Economic Community (EEC), it is perhaps easy to understand why Harold Macmillan was quite so bitter. After close to five years of negotiation, British hopes of joining the European Union’s antecedent had just been crushed – publicly – by a former ally, President Charles de Gaulle. Succeeding Anthony Eden as Prime Minister in 1957, Macmillan’s six years in power spanned a period of almost unprecedented change in Britain’s geopolitical status. The Suez Crisis of 1956, which had brought down the Eden government, demonstrated to the world that Britain was no longer a superpower in comparison to the United States or Soviet Union. No longer a major imperial power or, at least, no longer the major imperial power it had been twenty years before, the country was caught in a kind of malaise. The result was a difficult period of soul-searching about where Britain’s future should lie. By the late 1950s, Britain’s economy was also encountering problems. Although Britain remained a rich country – richer, per capita, than most of continental Europe – the disparity between the levels of economic growth in Britain and the rest of Europe were becoming increasingly obvious. In order to keep in business, British industry needed ever-increasing overseas markets for its products. Against this difficult backdrop, Britain was caught between two centres of gravity. One the one hand, the Commonwealth pulled the country towards its traditional export markets in the former colonies. Although very informal and disorganised, the Commonwealth – and especially the ‘White Dominions’ (notably Canada, Australia, and South Africa) – appeared to offer a way for the British to keep the economic benefits of empire as well as its sentimental attachments. On the other, attempts to form an economic union in Continental Europe were viewed with a mixture of scepticism and alarm. In March 1957, six European countries (France, West Germany, Belgium, the Netherlands, Luxembourg, and Italy) signed the Treaty of Rome, paving the way for a supra-national organisation intended to facilitate trade and political cooperation between the member-states. Macmillan faced a dilemma. Although not totally incompatible, Britain could not move towards both the Commonwealth and the EEC at the same time. The Macmillan archives on deposit at the Bodleian provide a fascinating snapshot of the difficulties of the decision, especially in the period immediately after the signing of the Treaty of Rome. They also show Macmillan’s attempt to play a difficult double game between what he termed ‘the practical’ and ‘the idealistic’ (Bodleian, MS. Macmillan dep. c.920, fol. 21). While he could certainly dress his actions in the ideology of Europeanism, he was also acutely aware of the dangers which a united Europe would create for a disengaged Britain. MS. Macmillan dep. c. 920, fol. 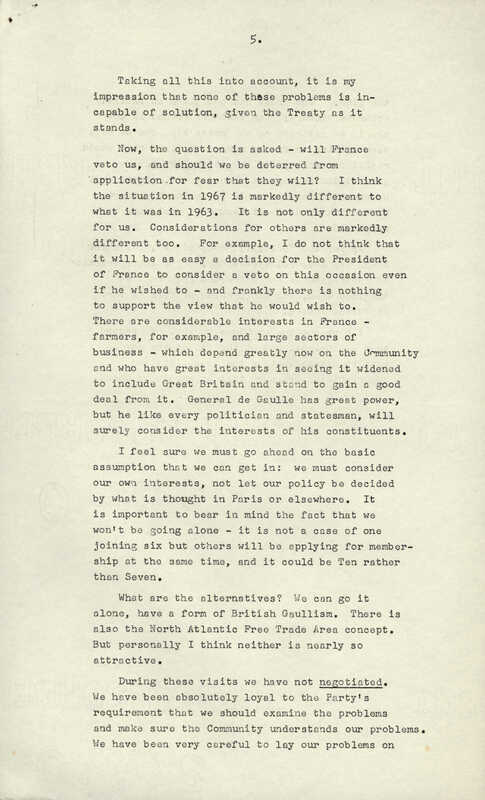 21: Luncheon Speech for European Free Trade Area, 20 Feb 1957. Reproduced with kind permission of the Trustees of the Harold Macmillan Book Trust. MS. Macmillan dep. c. 920, fol. 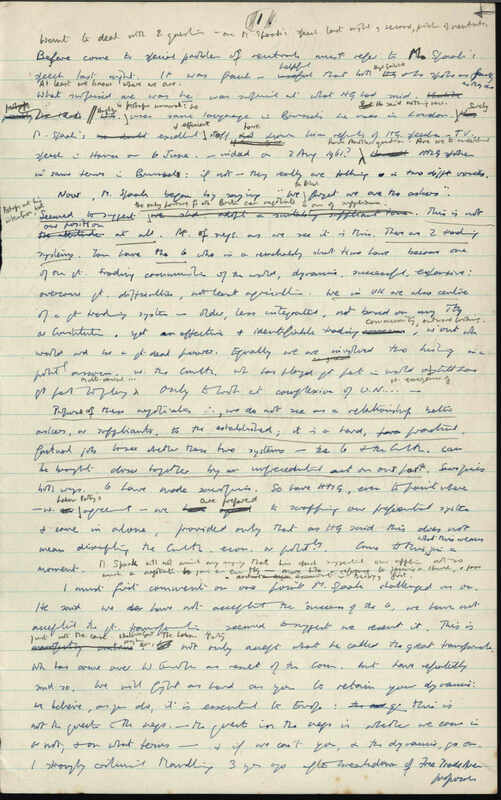 110: macmillan to Beddington-Behrens, 17 Feb 1958. Reproduced with kind permission of the Trustees of the Harold Macmillan Book Trust. MS. Macmillan dep. c. 920, fol. 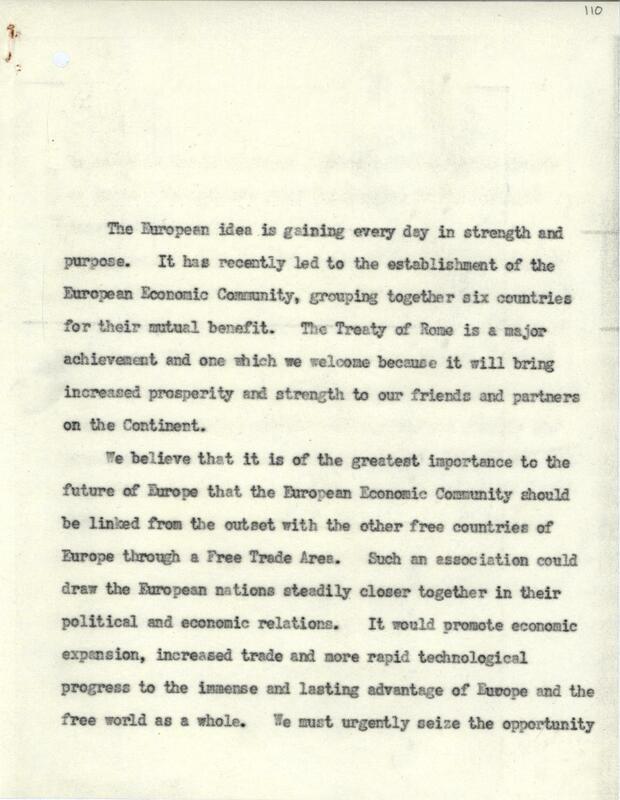 24: Luncheon Speech for European Free Trade Area, 20 Feb 1957. Reproduced with kind permission of the Trustees of the Harold Macmillan Book Trust. Macmillan realised that Britain could not preserve its economic and political status in Europe from outside a united Europe and, despite his reservations, began to negotiate with European leaders to get Britain in. Informal negotiations with ‘the Six’ began in 1958. Unfortunately for Britain, the same year saw the rise to power of General de Gaulle in France. Although concerned about the escalating war in French Algeria, de Gaulle still saw British membership of the EEC as potentially damaging to France’s international position and especially to its leading role within the EEC. Britain went to the polls in 1959 and re-elected Macmillan, giving him the mandate to formally apply for Britain to enter the EEC in 1961. Edward Heath, as Foreign Secretary, was sent to Brussels to open formal accession talks. Politically, British discussion on EEC membership hinged on two issues: the privileged position of the Commonwealth and agricultural subsidies. Both immediately created problems. The British refused to extend Free Trade to food because this would mean removing the existing heavy subsidies given to British farmers and a rise in food prices as a result. The Six, however, also refused to allow the Commonwealth to hold onto its existing trading privileges, despite Macmillan’s attempt to use separate negotiations with the Commonwealth as leverage against the Europeans. For Macmillan, the process was deeply dispiriting. ‘I think sometimes our difficulties with our friends abroad result from our natural good manners and reticence’, he wrote in June 1958. Gauging the public reaction to the process is difficult. The Labour Party, under Hugh Gaitskell, was certainly hostile. 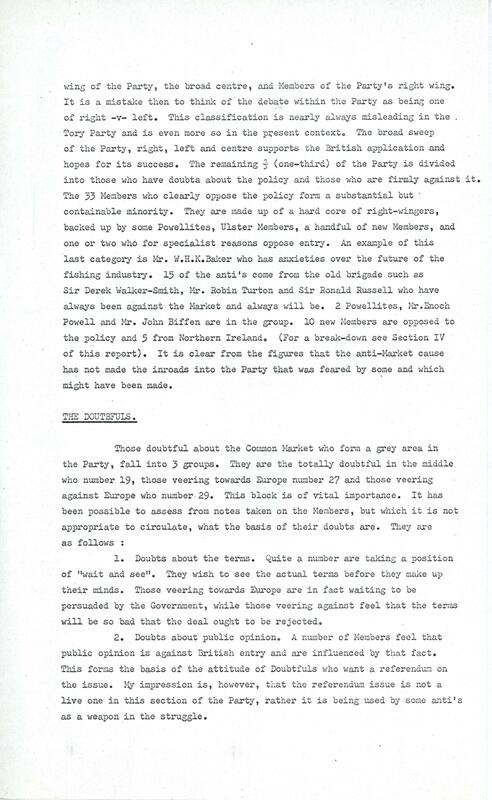 The Conservative Party Archive at the Bodleian does preserve a number of angry letters on the issue; many complain about the perceived ‘betrayal’ of the Commonwealth, others voiced suspicion of European motivations. Ultimately, however, public opinion was never put to the test. 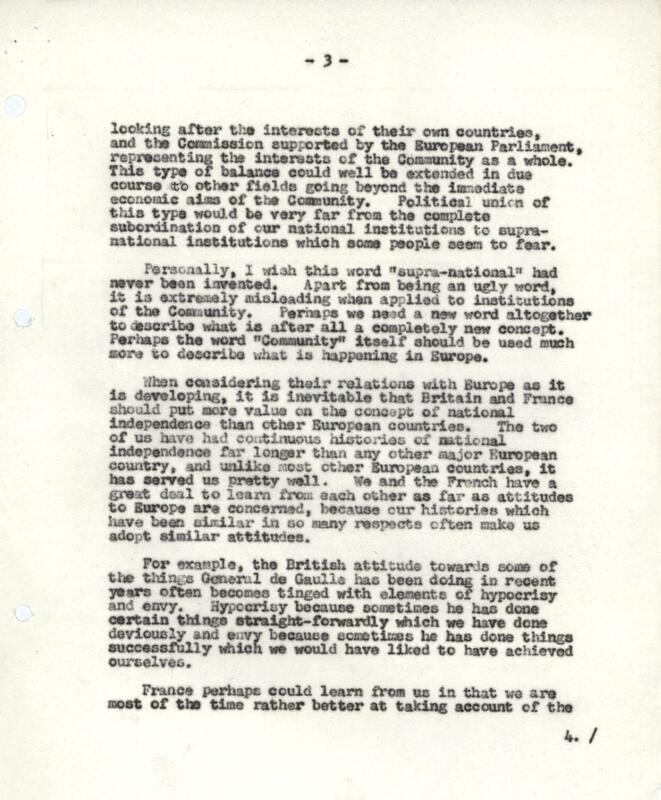 In January 1963, de Gaulle vetoed British membership of the EEC with his famous comment: ‘non’. Britain would have to wait until 1973 – and endure another humiliating French rejection – before it would finally take a seat in the EEC.